This was an incredibly beautiful and romantic stay. Hanging on the cliff edge over the caldera, the awesome view was unobstructed and panoramic. While centrally located, it is was far removed from the crowded and noisy towns of Oia and Thera, and also included WiFi and right-in-front free parking! And did I not mention the sweets and bottle of wine awaiting us! We had the "Deck" suite at the top, which provided for the most privacy, although all units would have great views. With our private deck with our own "warm" tub, we enjoyed a sumptuous and delicious breakfast on our deck each morning. Christina was an awesome hostess who ensured our very need was met and more, plus her staff of Melody, Maria and Elia were equally courteous and responsive. This was the most lovely, romantic and memorable location and stay of our entire 3 week trip to Europe. We shall return! The view is unbelievable and extremely private. Breakfast is custom to your liking and is delivered to your room each morning at the time of your request. The pools are very nice with an incredible view. I wanted a few days for myself to relax in Santorini. It’s peaceful and quiet, very relaxing and the location is stunning. Smooth pickup to and from the airport, the staff were all very warm and helpful at all times. They booked my tour of Santorini which I thoroughly enjoyed, especially the wine tasting. I can’t thank Christine, George and the team enough for a beautiful five days. Very close to the port so it's extremely convenient if you are arriving to Santorini by a boat. Terrific view of both Thira and Oia (how good is that!!!). Very intimate feeling as there are only 6 suites. Very clean and friendly staff. The staff was the most helpful and most delightful I've ever encountered on vacation. They were always smiling, and helping us find interesting attractions, as well as haggle for the price for us. The breakfast was delicious and abundant, it was really a treat! We were so enamoured with the staff that we had to hold ourself back from hugging everyone when we left! Everyone there was so amazing and so helpful. Best hotel experience I’ve ever had. The manager is absolutely phenomenal and she made our stay so perfect. The staff also made everything so effortless. Lock in a great price for Alti Santorini Suites – rated 9.5 by recent guests! 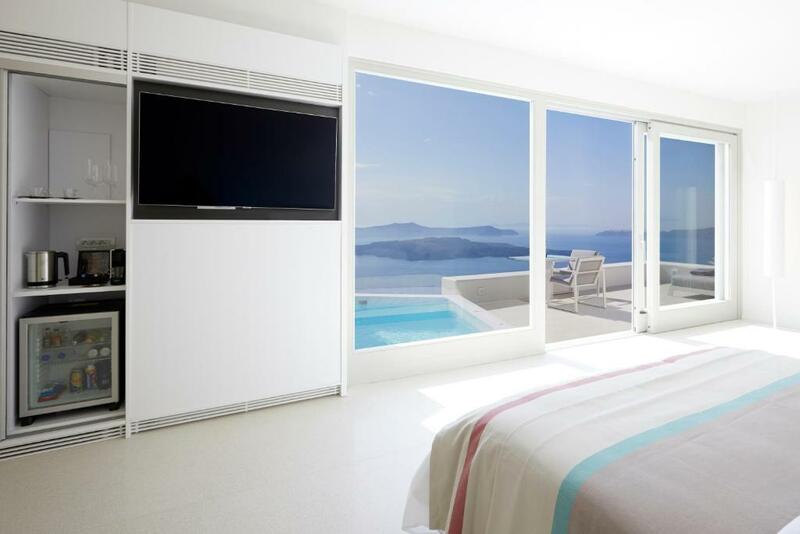 One of our top picks in Megalochori.Enjoying panoramic views over the Caldera and the Aegean Sea, Alti Santorini Suites offers minimal-style suites with outdoor and individual, heated plunge pools with hydromassage facilities. Built according to the local architecture, all units come with free WiFi. All suites have their own terrace and sunbeds with access to the plunge pool. Each includes a satellite, smart TV and a mini-bar. Guests can start their day enjoying the full Mediterranean breakfast served in their own patio. Restaurants and bars are 0.6 mi away, while a grocery store is just 650 feet from Alti Suites. Island’s main port is at a distance of approximately 2.5 mi. Perivolos Beach is within 3.7 mi. The owners can help with ticket services, as well as car and bike rentals. Free parking is available nearby. This property also has one of the top-rated locations in Megalochori! Guests are happier about it compared to other properties in the area. 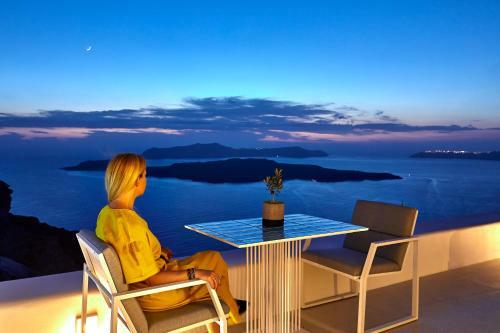 When would you like to stay at Alti Santorini Suites? Please note that the individual, heated plunge pool is located on the ground floor at the edge of the cliff, and there is no direct access from the suite. Please note that the individual, heated plunge pool is located on the ground floor at the edge of the cliff and there is no direct access from the suite. The Alti Santorini Suites team is aiming to provide our guests memorable stays, impeccable service and assistance for everything they may need. We want to be close to our guests and their needs in order to assist them with the best possible way.. In walking distance from Alti Santorini Suites are the Venetsanos winery and the Santowines winery where you can have a tour and wine taste. Additionally the traditional villages of Megalohori and Pirgos are in 15 minutes walking distance where are located a lot of restaurants cafes and shops. Moreover Fira town is only 5 minutes driving and Perissa beach is 10 minutes driving away. House Rules Alti Santorini Suites takes special requests – add in the next step! Alti Santorini Suites accepts these cards and reserves the right to temporarily hold an amount prior to arrival. The reception when i first arrived was not very hospitable, even though i was promised and EARLY CHECK IN IF POSSIBLE,I arrived almost one hour before check in time, i was not allowed and early check in even-though one of the staff told the room is ready . I liked the view from the room the hot tub and the breakfast. the room was clean bed and pillows were comfortable. also the size of the room was acceptable. The breakfast was absolutely beautiful. It had everything we requested and was served on time. Amazing view, amazing room, amazing service!! Will stay there again next time. Walking on the road is difficult, so highly recommend hiring a car. The staff can help with this! The friendliness of the staff was magical, really made us feel like family. And the view!! Doesn't get any better than having breakfast on your balcony overlooking the water! Very friendly staff, wonderful view from the room and the jacuzzi towards the caldera. The plunge pools are nice, but a large pool would really put this small hotel over the top! The breathtaking view and superior service does not get any better. Would rate both higher, if possible. Loved the close villages of Megalochori and Pyrgos. If you want to visit the towns every day. Taxis are expensive. Hire a car, quad bike or scooter. The staff were friendly and happy to do anything to make the stay special. The view is the best. The villa had lots of space and Netflix on the big screen, so we could watch a movie in English. From the moment that we arrived to these amazing Suites until the moment when unfortunately we left everything was something more than AMAZING. Stuff was always kind and helpful , breakfast deserves 5* !! and our suite was too clean , too wonderful! Definitely we will come back!!! Thank you for everything!